You knew the moment you walked through the perfectly preserved arch-topped doors that this was one very special house. As your real estate agent guided you from room to room, all you could think was that there had to be a catch to this house. Something had to be really wrong for such a gem to even be available in your price range. The history, the craftsmanship, the neighborhood! It was all too much. So you bought that fabulous house. And now you’re thinking about applying for a historic designation, since it is such a lovely, special structure. Federal. Managed by the National Park Service, both the National Historic Landmarks Program (NHL) and the National Register for Historic Places (NR) accept the right homes. These properties are strongly associated with significant events and people from America’s history, as well as buildings that stand as excellent examples of construction or engineering methods. NHL properties must be important on a national level, but NR homes can be of strictly local significance. State. Not every state has a register, but plenty do. The requirements vary widely, but you can expect that the home in question will need to meet much of the same criteria as for the NR. Contact your State Historic Preservation Office for detailed information on its application process. Local. If you already live in a historic district, you may be familiar with the workings of local historic designations. Often, homes already within a district with special zoning that is worded such that their historic integrity is preserved by default are easy to get onto a local registry. Otherwise, you may be able to secure a stand-alone historic designation (or band together with the neighbors to create a historic district). Creating a new district means that a new preservation ordinance will have to be created, too. It will govern how properties are designated as historic properties within the district, as well as establishing a design review board. Note: Your home can easily qualify for all three designation levels, so research your history carefully in order to build the best case possible for the historic designations you’re seeking. 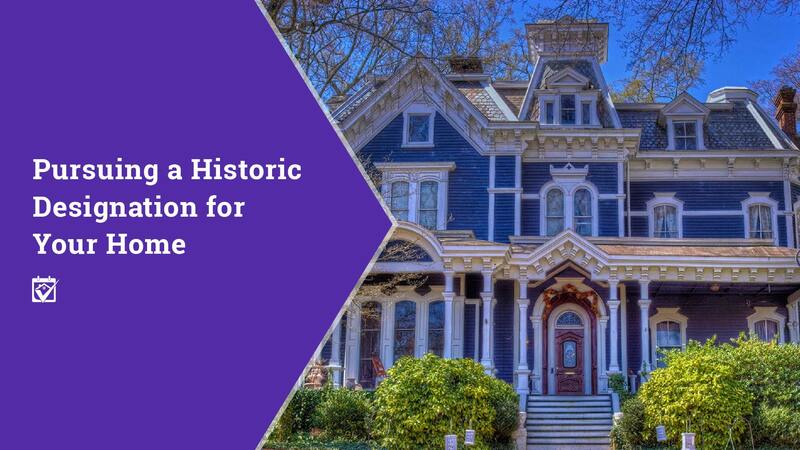 Buying that potentially historic home may have been one of your best decisions ever, even if you don’t end up getting a historic designation. Older homes have so much about them to love, along with a lot of things you’ll quickly learn are (potentially unlovable) quirks unique to that property. Turning your older home into an officially historic property is an involved process, but for many homeowners it’s worth the effort. Let’s look at the pros and cons of it. Grants, low interest loans and tax credits. Depending on where your home is located, the shape it’s in and whether or not the area is already a designated historic district, you may be able to rack up the dollars to help fund your remodeling projects. Keep in mind that you’ll probably have a lot of rules to follow to keep the home as close to historically accurate as possible, but that will absolutely vary from district to district. Potential bump in value. This is a tricky one. If you’re working with a real estate agent and an appraiser that understand the value of a historic designation, then you may see a bump in your home’s value once you’ve secured it. This is good if you’re looking to sell, possibly better if you’re just looking to refinance and shed some mortgage insurance. It could also increase your taxes, though, so keep that in mind. Protection from federal government work that may threaten it. This is a little trickier, but any property listed on the federal registers is protected from threats from federal building projects. If the federal government wants to build a highway through your front yard, you can waggle your brass plaque at them and they’re generally not able to interfere. Can come with lots of rules and slow red tape. Getting a house designated as “historic” means doing some major paperwork, but you knew that was coming. You might have not expected the years-long wait for the designation to be approved or denied. Even if it is approved, you may have a lot of new rules from your municipality to deal with. So, basically, you’re going to be dealing with red tape and government bureaucracy as long as you own that historic property. Insurance may be higher. You may pay more for insurance due to extra costs associated with rebuilding a historic structure, plus the likelihood that something in your house isn’t up to code. After 50 or 100 years, it’s to be expected, really. Things in the walls you just can’t get to pose risks and your insurance company knows this. You may have to bring systems completely up to code. Generally, building codes allow for older homes to kind of get a pass if they’re not totally up to code. As long as the item in question was up to code when it was installed, then it’s ok for now, but if you put in a new one, it’ll have to meet the current building codes. For example, if you ever want to upgrade the ungrounded electrical panel that was put in during the 70s, it’s not a small thing. You’ll have to have your home’s electrical system evaluated by a professional, permits pulled to update your connection to the power grid to match the new panel and an inspection from the municipal inspectors to ensure the work was performed to code. After all of the paperwork and red tape, finally receiving your historic designation can be a huge relief. Except there’s one thing no one apparently mentioned…. when you sell that property, the new owners don’t have to maintain the house or even keep up its historical appearance unless there are other rules in play, like being located in a tightly-regulated historic district. Still, if you want a historic designation, you may find the benefits are well worth everything. You might as well go for it as not. Get that historic designation for yourself, not because you want to protect your home from future owners and for generations to come. Buying an older house means understanding the many issues that they can have. Start off right by having a home inspector look it over during your inspection period, before your mortgage closes. Follow up with a friendly neighborhood electrician, HVAC pro and a plumber, bare minimum. The old systems aren’t just annoying, they can be dangerous if they’ve not aged well or been updated at all since they were installed. But where can you find a collection of home pros you can trust? Check out the HomeKeepr community! Every pro in it was recommended by a real estate agent due to their excellent service and high quality workmanship. Cut out the guessing and get right to the pros that can help you maintain and even refresh your older home.